Note: This case is fit 4.7 version of the iPhone 8 / iPhone 7 only! ★Impeccable craftsmanship and styling. This would make a great gift as it comes in a very classy box and is wrapped in it's own fabric envelope inside. [LIFETIME WARRANTY]: In order to pursue a higher customer experience satisfaction, all leather cases sold by TUCCH are covered with LIFETIME WARRANTY. If any non-artificial quality problems, please contact us to get a new replacement free of charge or refund. Designed and Sold by TUCCH. If you want more Leather Wallet Cover (Like Cases for iPhone 5s / SE / 5 /iPhone 6s Plus / iPhone6 Plus / iPhone6 / iPhone 6s / iPhone 8 Plus / iPhone7 Plus / iPhone7 / iPhone 8 / iPhone X / Samsung Galaxy S8 / S8 Plus / Samsung Galaxy S7 / S7 Edge / S6 / S6 Edge / LG G4 etc. ), please search our brand TUCCH. 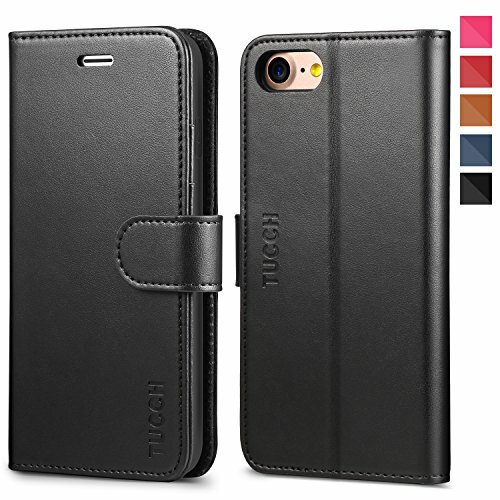 DESIGN: The TUCCH iPhone 8 leather Case is a perfect fit your 4.7 version of the iPhone 8/7! Our handmade design gives that classic feel while offering a left-turning cover and a perfectly-curved case without rough edges or trimmings. We designed our case to exemplify the power and beauty of simplicity. MULTIFUNCTION: (1). Included 3 card slots and 1 money pocket, carry around your credit and debit cards, and cash without having to take your wallet with you. (2). Can stand phone up to watch something hands-free. (3). Magnetic flap to keep it closed and protected, secure magnetic closure. COMPREHENSIVE PROTECTION: The iPhone 8 flip wallet leather case covers all corners and provides great dual-layer protection to your smartphone.The durable soft TPU full-body inner case comes with cushioned shockproof edge and ensures your phone against drops and bumps. NEVER OUT OF TREND: Beautifully crafted in classic low profile design. Feels great in the hand and has a smooth button action on iPhone 7 book case cover. Suitable for everyday life and business trip. Engineered to emphasize thinness without compromising Phone security. Precise cutouts give you full access to ports, and sensitive button covers allow responsive presses. If you have any questions about this product by TUCCH, contact us by completing and submitting the form below. If you are looking for a specif part number, please include it with your message.